Oh, Valentine's Day. You either love it or you hate it. Either way, you should probably get something for that special someone in your life. What I love about this gift is that it could be given to anyone. I made this sweet red and gray pair last year as a gift husband, but it would be equally appropriate for a friend, a galentine, a child. Anyone who loves ice cream...or coffee! 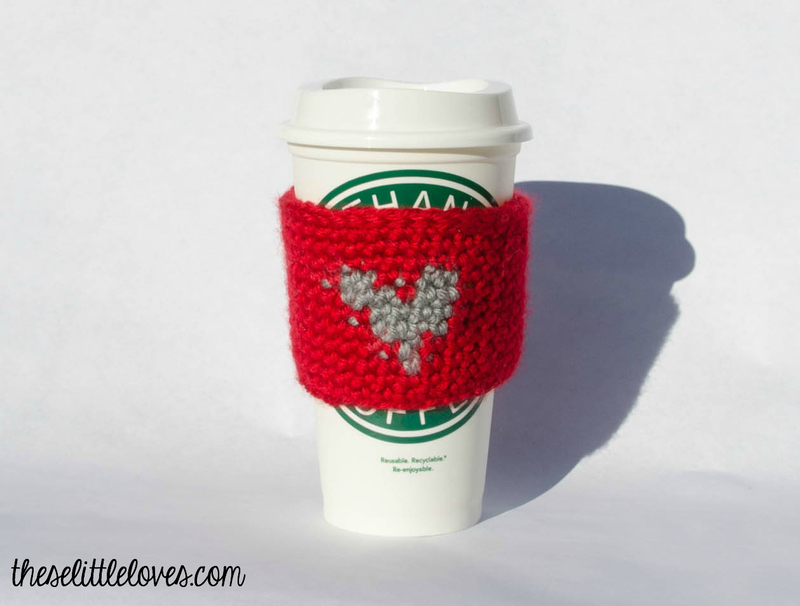 It turns out this koozie can also be used as a coffee sleeve. It fits my reusable Starbucks grande cup perfectly. Notes: This pattern is written with Red as the background color and Gray as the heart color. This pattern switches between two colors to make the heart pattern. If you are unfamiliar with how to switch between colors in crochet, you can find more information online such as this. 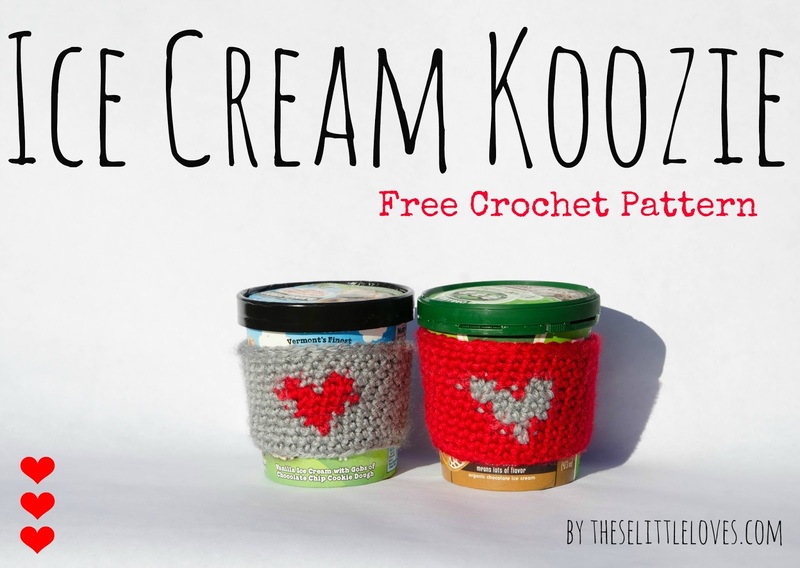 I did not 'crochet over' the other color, but instead let it float on the inside of the koozie. Below in the pattern, I have denoted this switching of color by stating which of the loops should switch to the new color. I also use stitch markers to mark the beginning/end of each row. Note - Start each row into the first stitch of the previous row. Tie off and weave in loose ends of both colors. 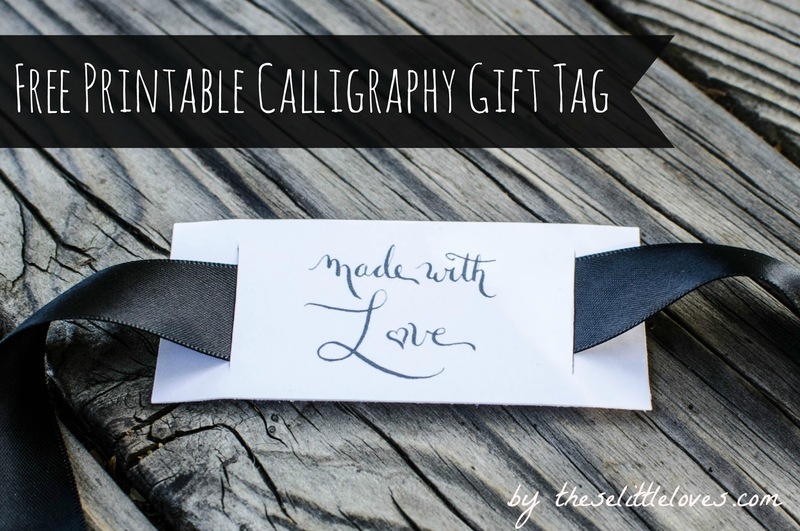 Also check out my printable calligraphy gift tag to let them know it was made with love :). As always, I would love to see your creations with this pattern! Feel free to tag me on Instagram @theselittleloves or post it to the blog Facebook page. Happy crocheting and let me know if you have any questions! If you follow me on Instagram, you have seen that things are a little baby crazy over here! 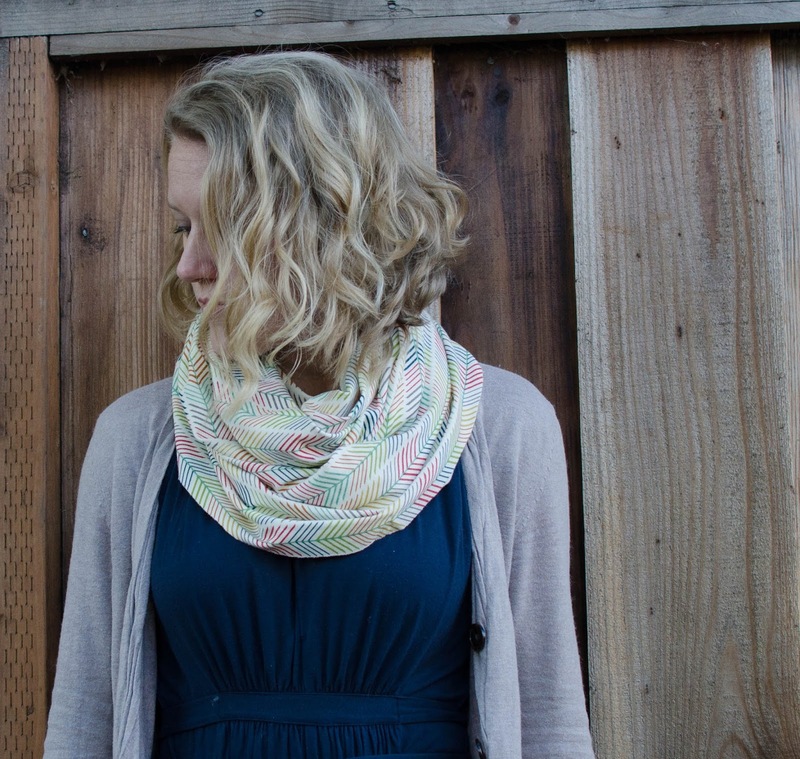 In honor of our long-awaited and long-prayed for good news, I am going to share my latest go-to baby shower gift - an infinity scarf that doubles as a nursing cover. Or maybe it is a nursing cover that doubles as an infinity scarf. Either way, these babies are super simple, crazy useful, and stylish. 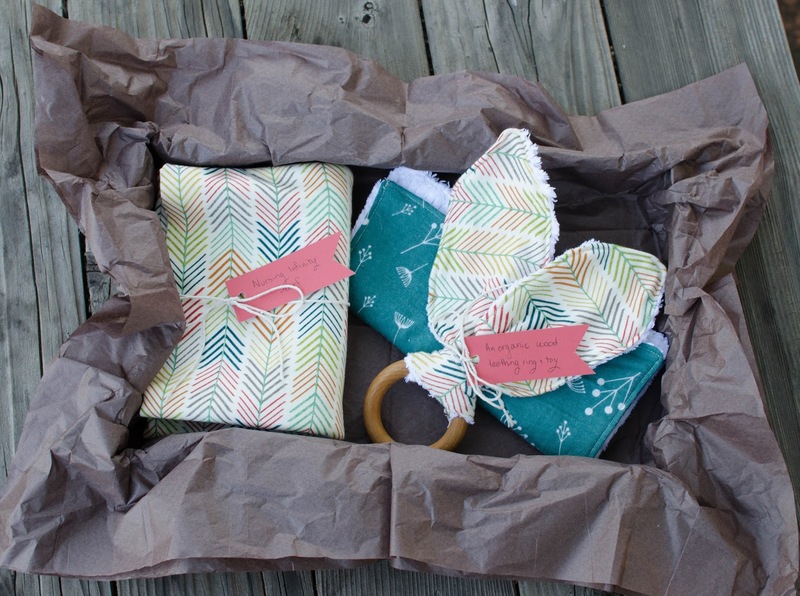 Paired with my bunny ear teethers and burp cloths, you have one killer baby shower gift. You can even coordinate the fabrics for an additional cuteness factor. If you are unfamiliar with this style of nursing cover, they are genius. Seriously, whoever first came up with the idea - you are brilliant and I hope you made a ton of money. You look cute, can pull it out whenever, and my favorite feature is that it covers your back while nursing! If only I had figured out how to make such an adorable cover for my first kiddo! How is my hair blurry? 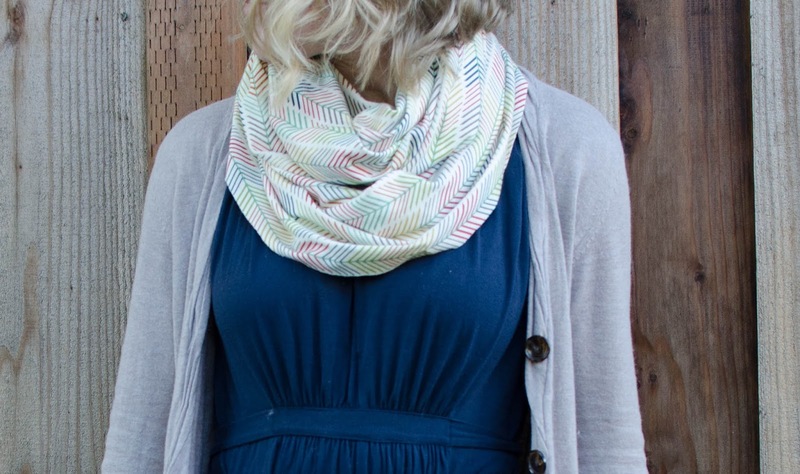 The biggest decision in making this nursing scarf is fabric. I've made quite a few of these now and I have learned a few things. I highly recommend a high quality knit that is soft and has good stretch. Knits aren't as scary as you would think to sew and they will give the momma and baby a little wiggle room. 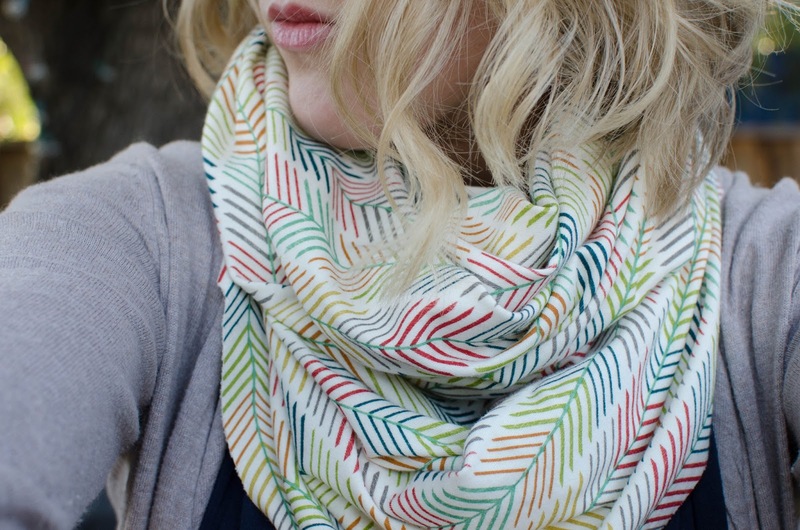 Also, when considering the pattern on the knit, think about its use as an infinity scarf. You will likely see a bit of the underside of the fabric when twisted around the neck. A double-sided knit is ideal, though in the photo above I use a fabric that is printed only on one side. This particular fabric works as the base color of the pattern side and the reverse side of the fabric is the same. Using a fabric where the right and wrong sides are substantially different can be fine if the two sides complement each other or if you double up the fabric before sewing (essentially doubling the thickness and making both sides patterned). I recommend a piece of fabric that is at a minimum 24" x 60" with the direction of stretch in the longer dimension (what will be the circumference of the scarf). If the mom-to-be is particularly tall I would recommend increasing the 24". If the knit is not particularly stretchy in the circumference of the scarf, I would increase the 60". Prewash and dry your fabric. 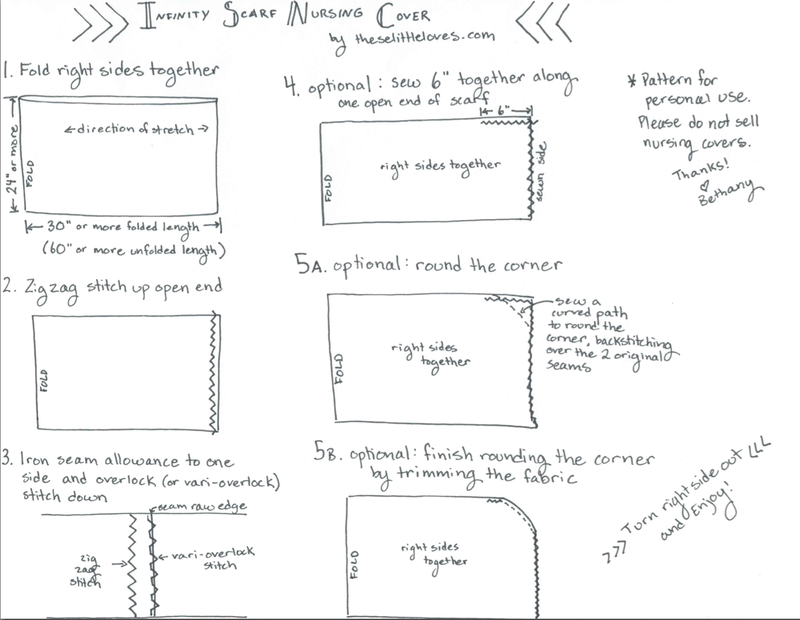 Lay the fabric out, folded in half with the right sides together (see image below or download the free pattern). Pin along the short open end and seam with a zig zag (stretch) stitch. Iron the seal allowance over to one side and use an overlock or vari-overlock stitch to sew the raw edge of the seam down to the main scarf fabric. This will finish the seam and clean up the inside of the scarf. At this point, you could stop here. This would be a perfectly lovely infinity scarf that could easily be used as a nursing cover. 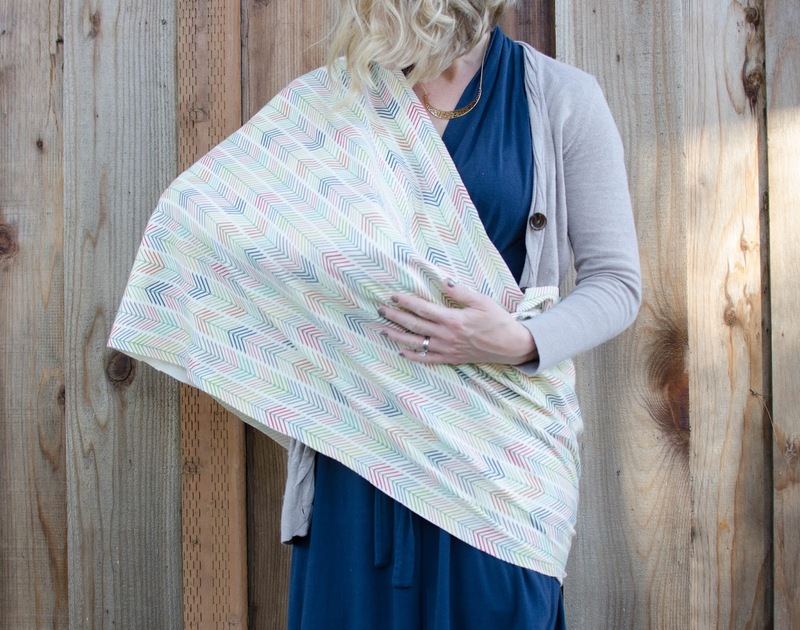 For a bit more customization, you also have the option of adding a small seam along one of the open sides intended to add more privacy for the mom during nursing. I like to put the added seam at my waist under my free arm (as seen in the above photo where I am pretending to hold a baby), but I have friends who prefer to put the sewn 'corner' on the shoulder. Either way works great. If you do include the seam, I would suggest rounding the corner as I will outline which allows it to hang better when twisted up into a scarf. To add the seam and round the corner, start by pinning together about 6" of fabric from the sewn edge of the scarf along one of the open ends (see steps 4 and 5 in the free pattern). Depending on your fabric dimensions, you might want to try this on and see if you want to increase the length of the seam. Once you are happy with the pinned section, sew with a zig zag stitch. To round the corner, draw a curved line starting at the 6" seam and curving down to meet up with the seam up the side of the scarf. I would backstitch a few times when the curved seam meets up with the original seams. For this curved seam, I used a straight stitch. Then trim the fabric above the curved seam. You will cut through the two original seams. Turn the scarf inside out and enjoy! I would LOVE to see your work with this pattern. 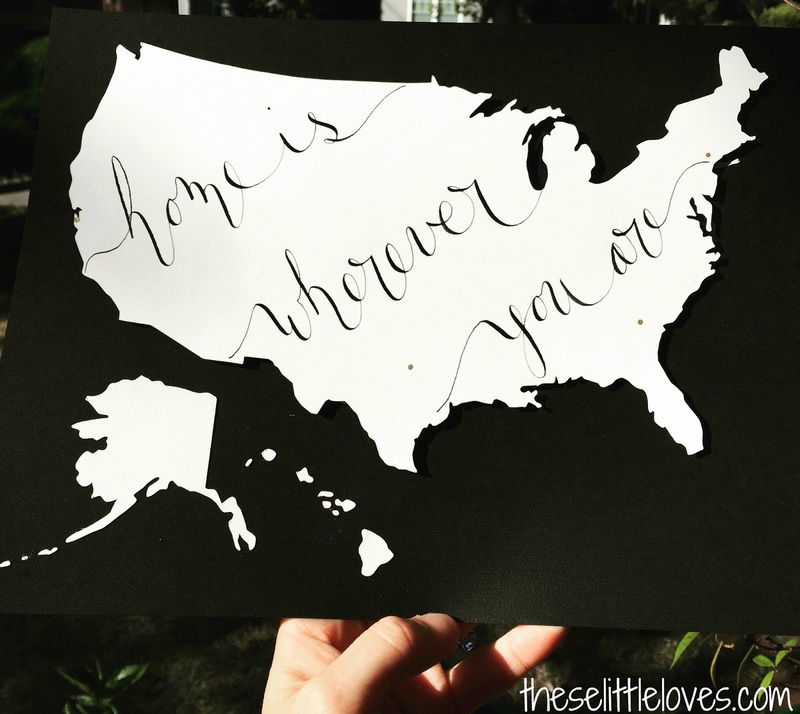 Feel free to tag me on instagram @theselittleloves so I can see your lovely creations! 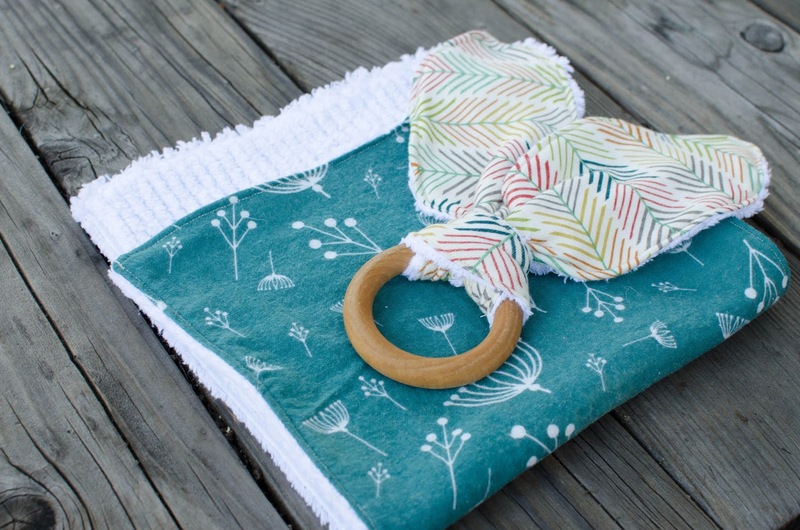 And don't forget to check out my other baby patterns: bunny ear teethers and burp cloths. 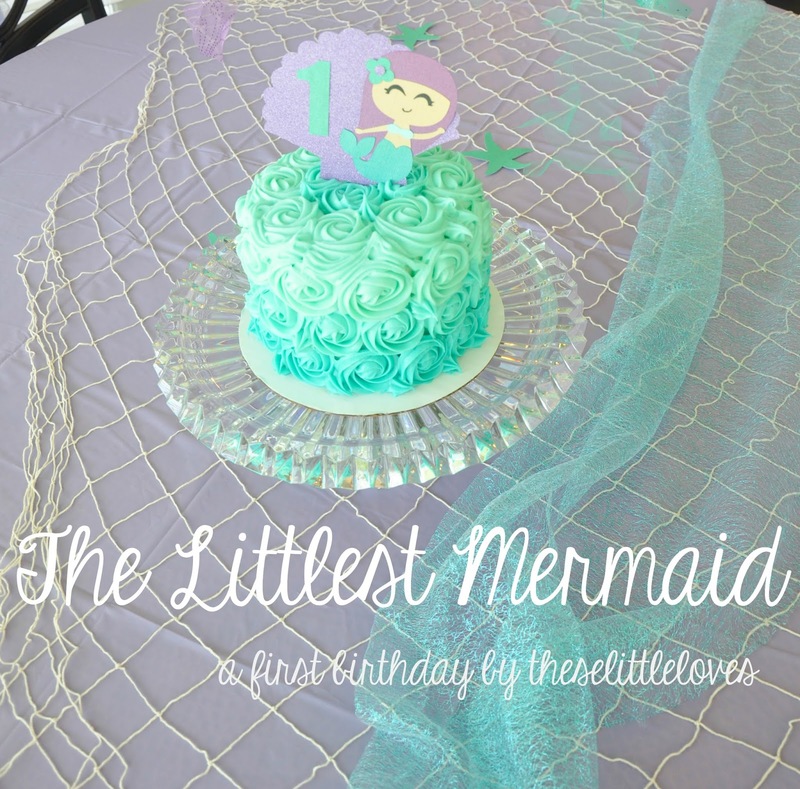 Last summer I shared my niece's first birthday party, a fun and girly mermaid affair with plenty of sparkles, sea creatures, and seaweed. 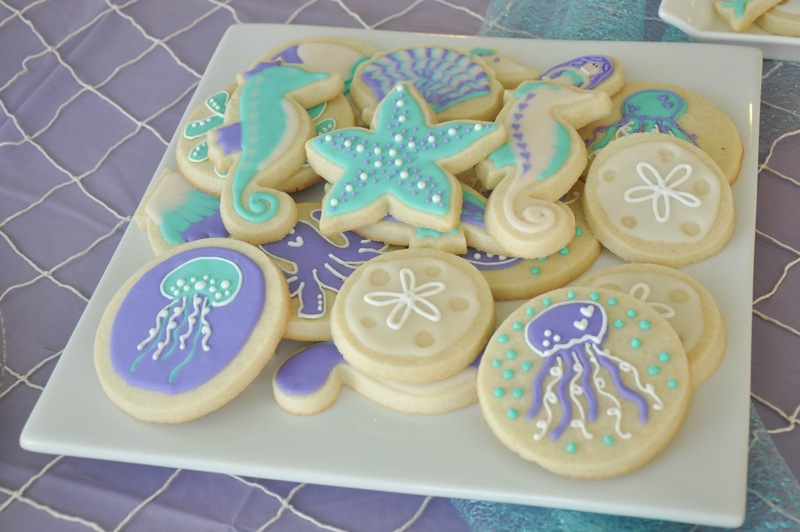 Tons and tons of girly, pretty seaweed. 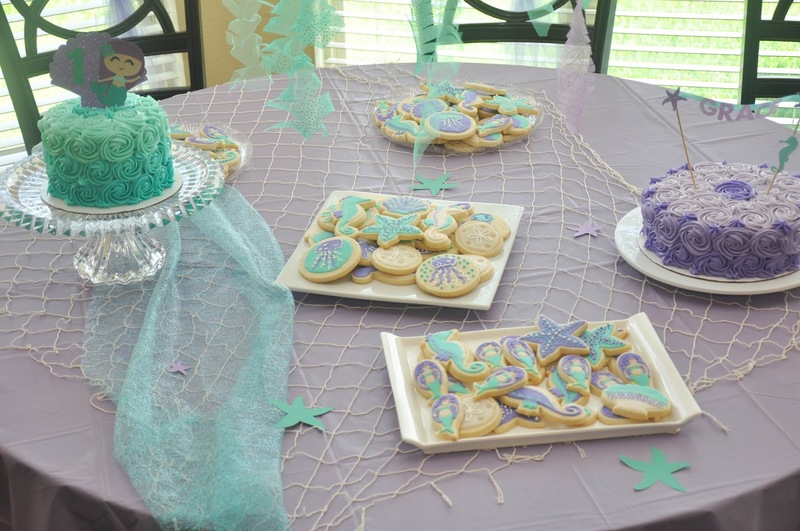 I threw seaweed on just about everything...the front door, chairs, food tables, chandeliers, the gift table. 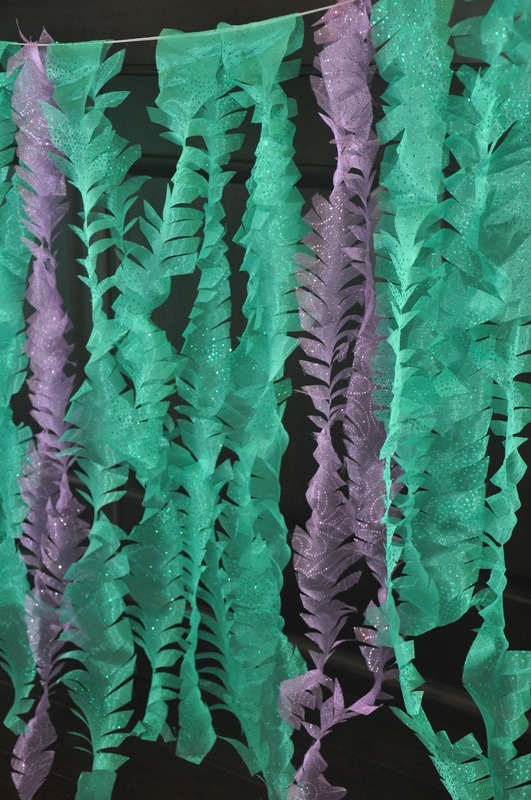 Large scale party decorations can often get quite pricey, but this seaweed turned out to be a simple and inexpensive way to make a big sparkly impact. 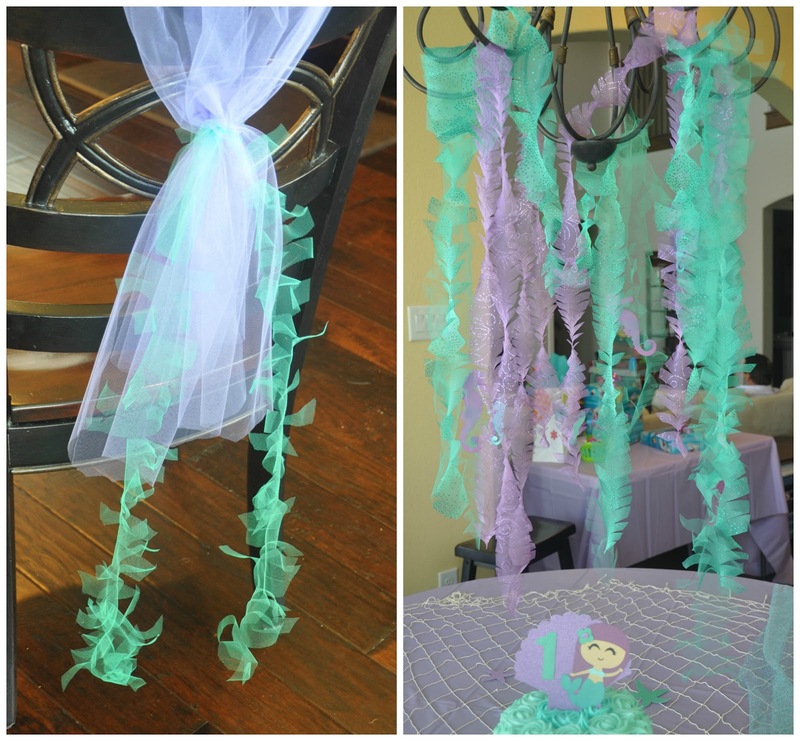 It gave the entire party a whimsical feel. 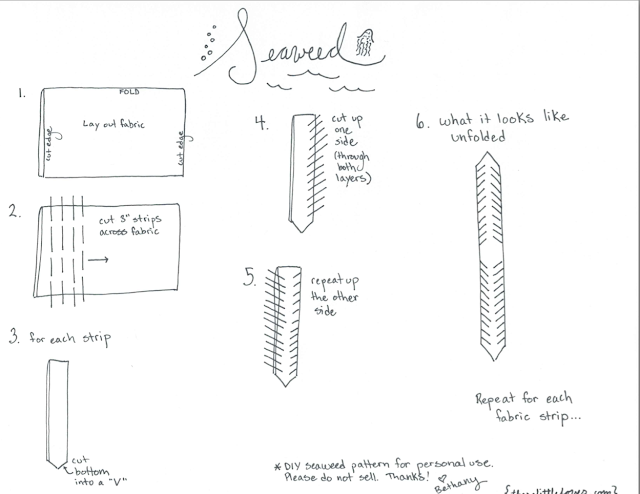 The cost of the seaweed will entirely be decided by the fabric you choose (and how many coupons you have for the fabric store). 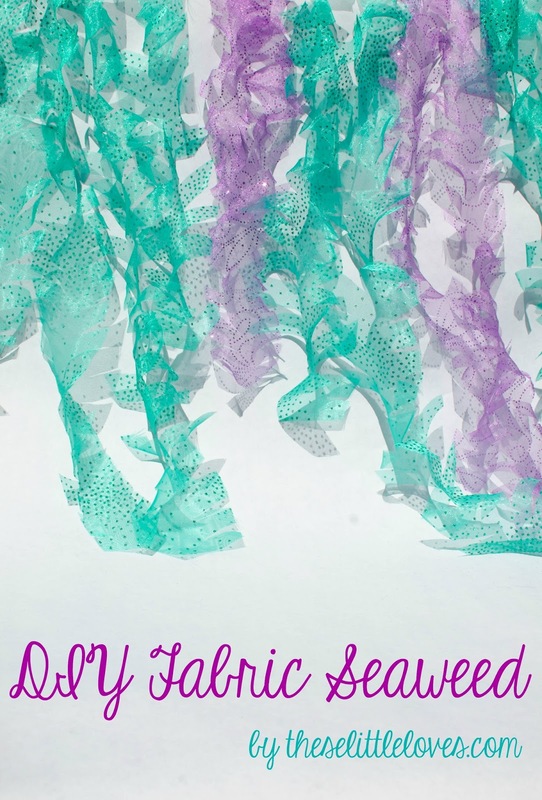 I chose three fabrics: a glitter organza in Jade, a glitter organza in Dewberry, and a matte nylon tulle in Jade. The glitter organzas were by far the prettiest and my favorite, but are a little more expensive in the regular price $8 per yard range. With a coupon or a sale, these become entirely reasonable and worth the price. Each yard will get you roughly 10-12 long strands of seaweed. I purchased 2 yards of each of the glitter organzas and 3 yards of the tulle. 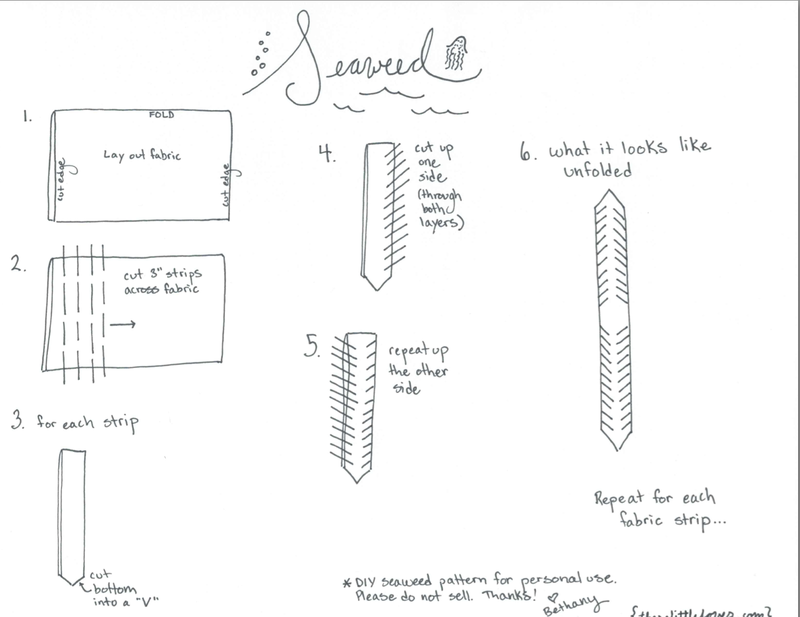 To cut the seaweed, start by moving all your living room furniture so you can lay the fabric out on the floor. Oh wait, you probably don't live in a teeny tiny Bay Area house. 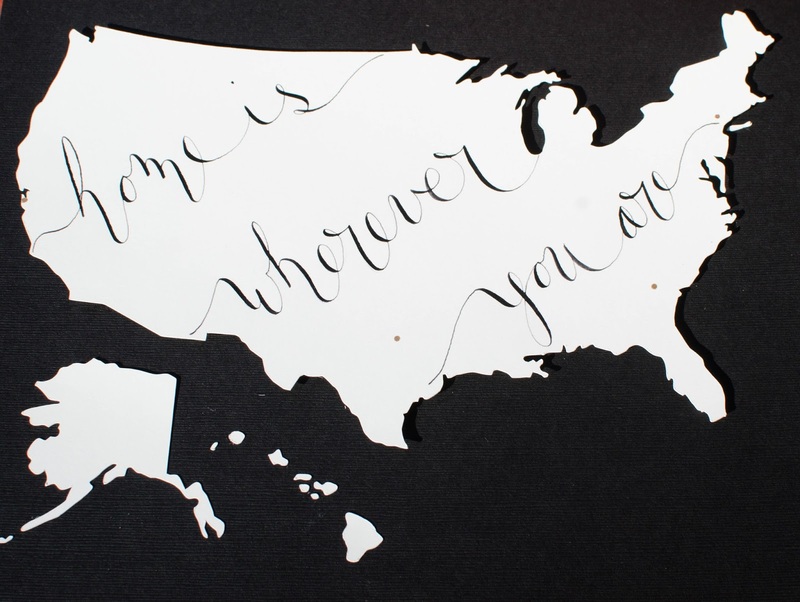 In that case, just toss it on your cutting table in your huge and lovely craft room while sipping a glass of wine. A girl can dream, right? Fold the fabric in half (the long way). Either with the scissors or with the rotary cutter/cutting mat, cut the fabric into 3" wide strips. There is no need to measure or be exact here, the seaweed is very forgiving. I will warn you, this next part does get a bit tedious. Grab your scissors, put on a few episodes of Fixer Upper, and get comfortable. (Insert glass of wine here?) You will be hand cutting the little notches in each fabric strip. With each strip still folded in half (cutting both layers at the same time), cut the end of the fabric strip into a V (like a tie). Then follow that same angle and cut up each side of the seaweed about every inch. Again, no need to measure. Be sure to only cut into the strip partway, leaving an uncut section of fabric running up the center of the strip. 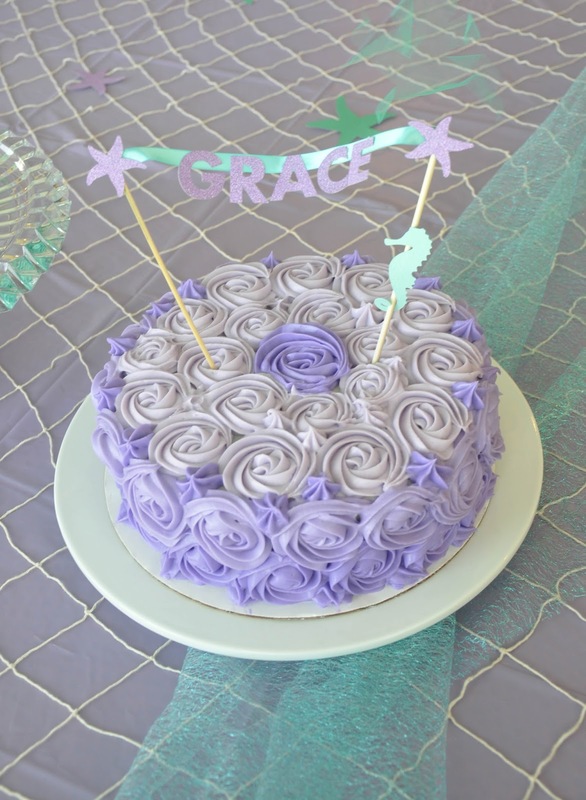 I also did not cut notches into the area of the fabric around the fold, leaving a section that could easily be draped or tied over a ribbon garland or chair. I think it would look fine if you did cut this section, you would just have to transition from one direction of 'notch' to the other. 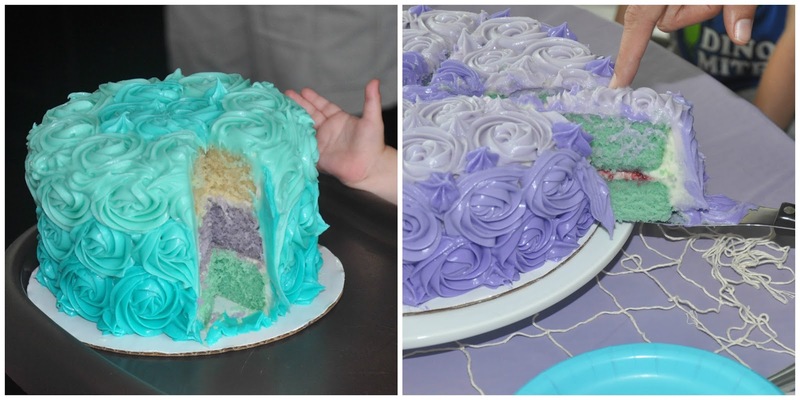 This is a little hard to describe so check the 'cutting pattern' below for pictures that help. You can download it for free here. Once the cutting is done, hold up the fabric strip and watch it 'curl' at the cut edges and start looking like seaweed! 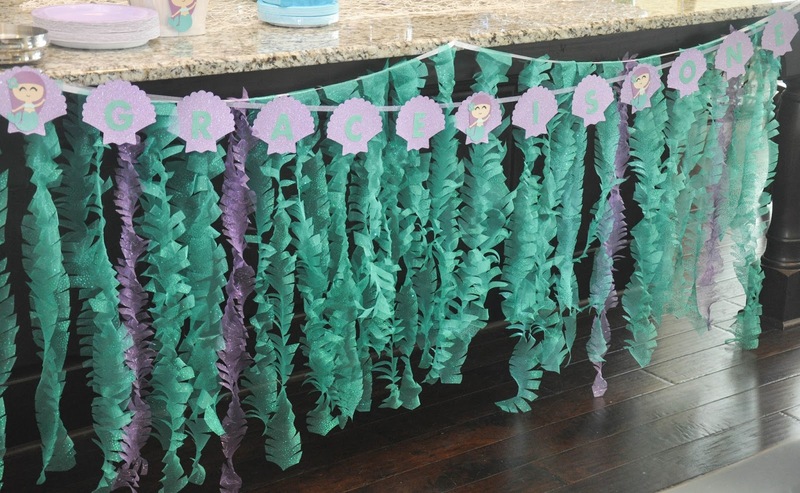 For ideas on how to decorate with the seaweed, check out the full party blog post here. 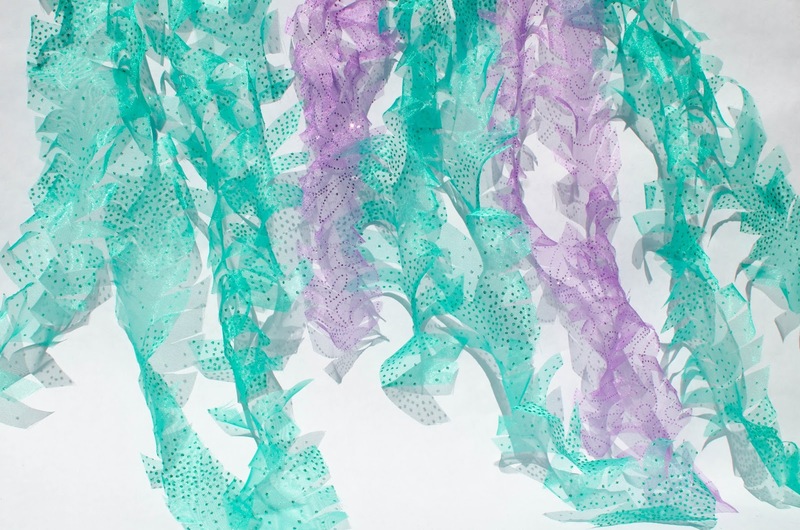 One quick idea...get a few paper cut seahorses and wind them into the seaweed! 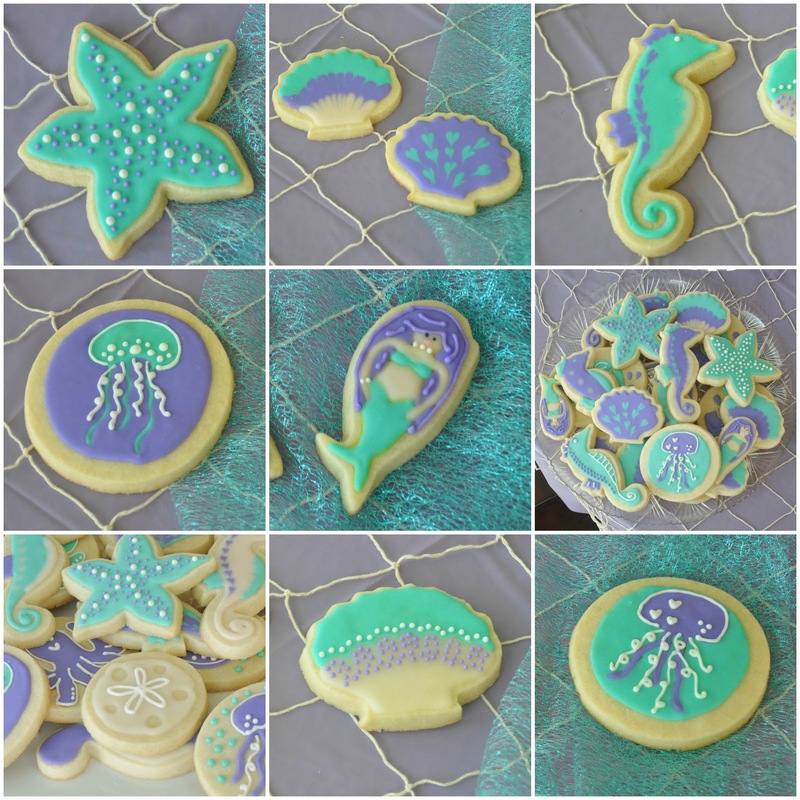 Interested in the seaweed, but don't have the time? 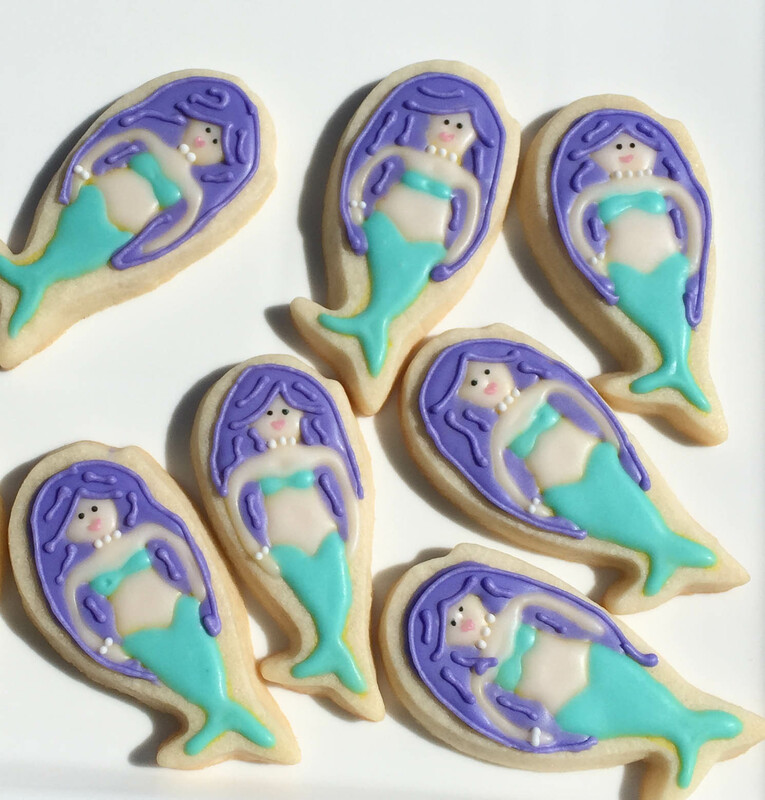 Check out my etsy listing here for the mermaid party pack while it lasts! 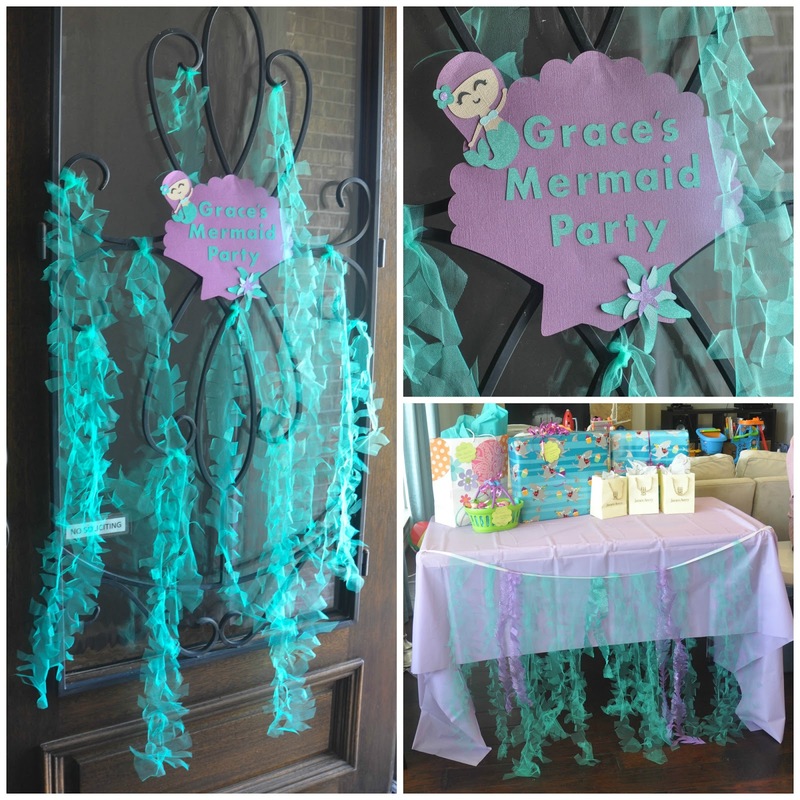 I have been so excited to share this party with you!! I made myself wait until I got through a bit of my blogging backlog, but I can't wait any longer. This might just be one of my favorite parties yet. This also happens to be the very first party I have ever been paid to plan. 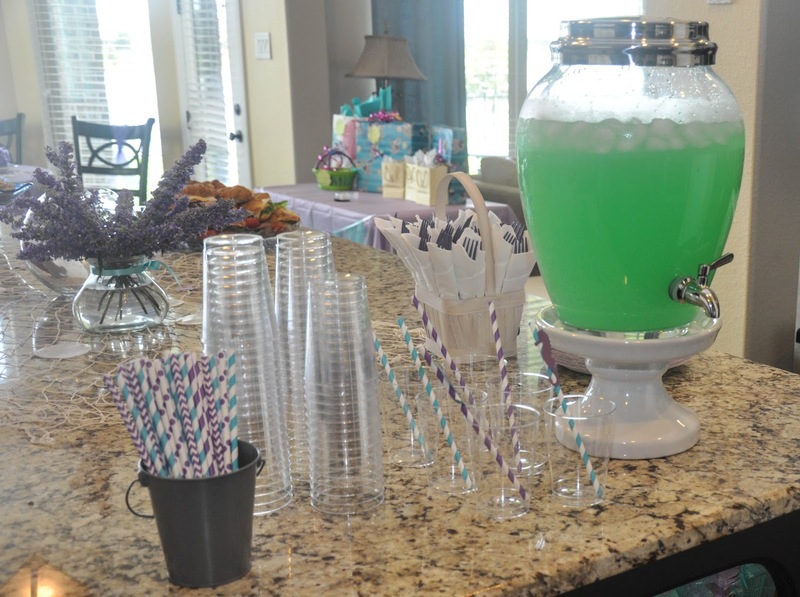 And while I still don't plan on starting a party planning business any time soon, I must admit it was pretty fun. It didn't hurt that my 'clients' were two super awesome friends of ours. Our friends were throwing an engagement party BBQ in honor of their brother and his fiancé. 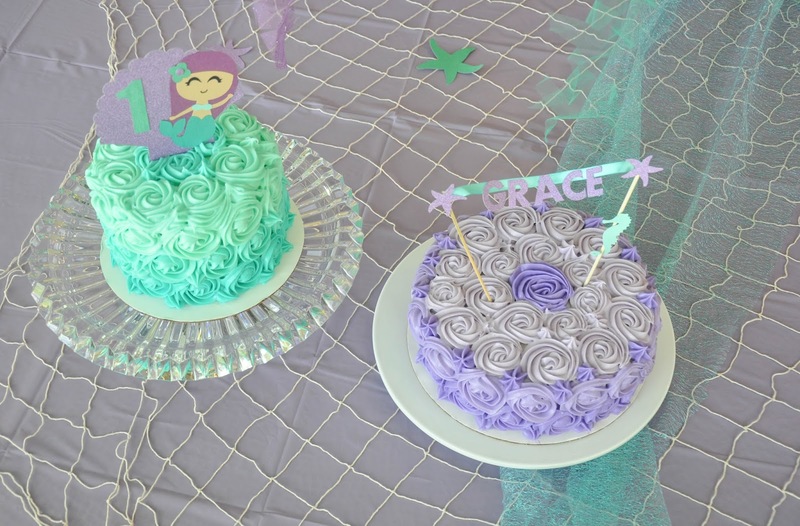 The original inspiration for the party decor was the bride's love of funfetti cupcakes and the fact that the couple met at a first birthday party for our friends' daughter. I loved the idea of a very festive confetti theme, and decided to make it slightly more adult and fancy with the addition of calligraphy accents. 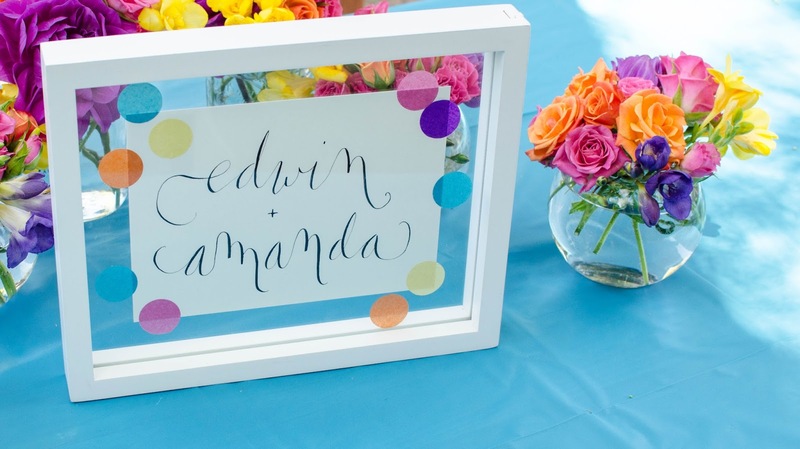 A calligraphy and confetti door sign welcomed the guests to the party. 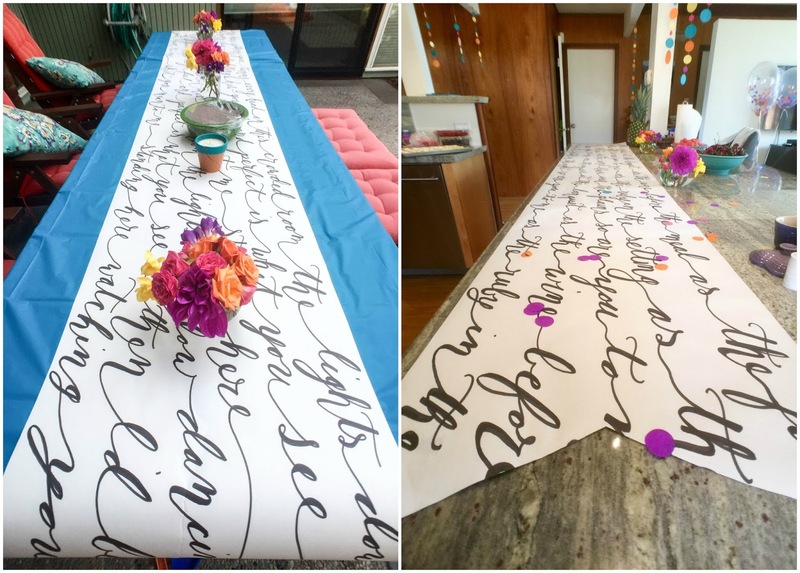 Inspired by my calligraphy table runners for the cookies and milk engagement party, I created black and white versions using song lyrics from the music for their first dance. It turns out you can make something pretty fancy looking with a roll of kids art paper, a pencil, an eraser, and a big Sharpie. 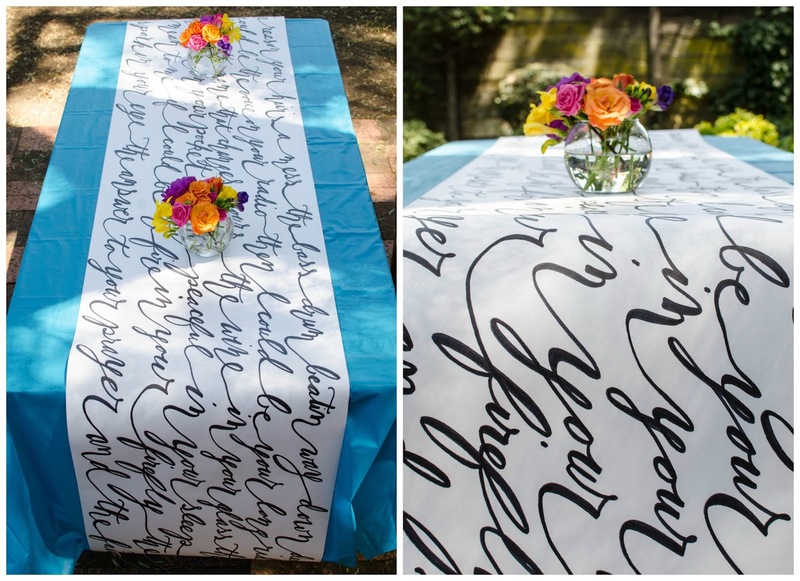 I chose turquoise as the primary background for the black and white calligraphy. 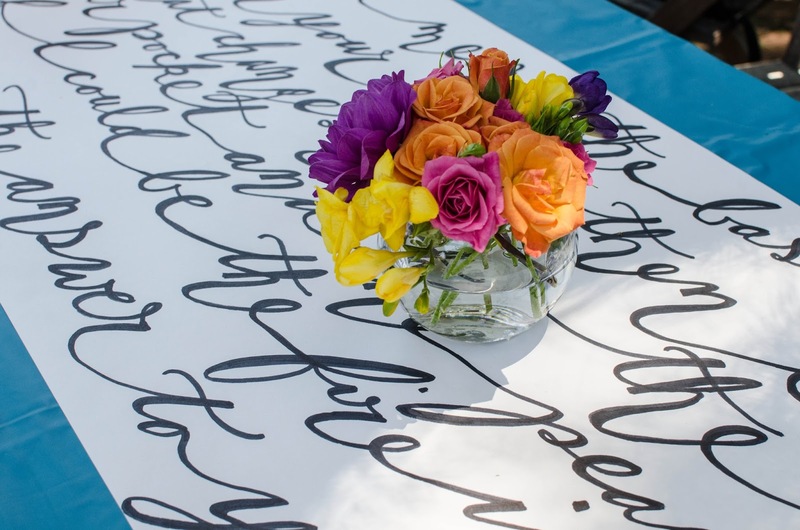 Small colorful floral arrangements of spray roses, dahlias, and freesia kept the confetti theme alive on the tables. 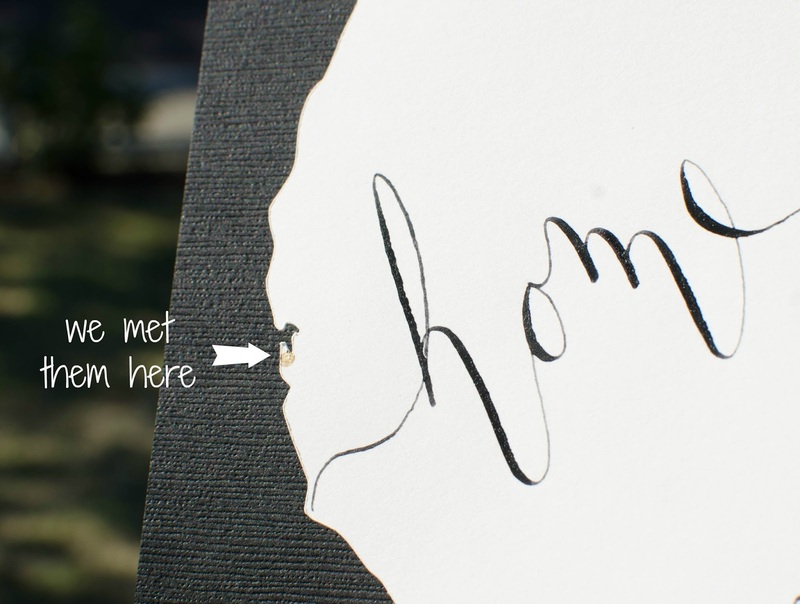 I also created a custom piece of calligraphy artwork that doubled as a party decoration and a gift for the lovely couple to take home. 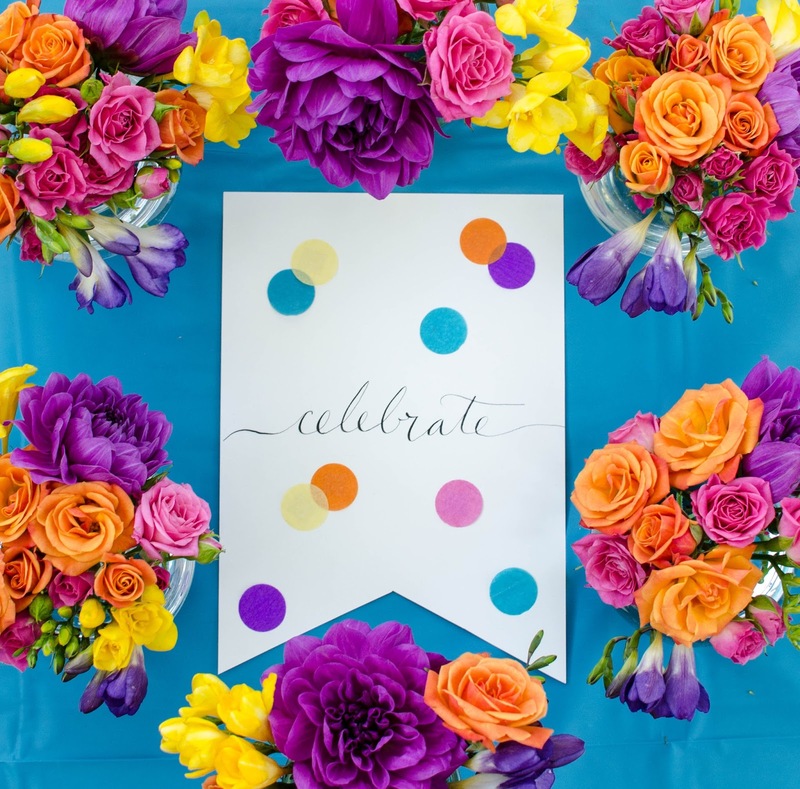 One challenge with a confetti themed party is how to incorporate the confetti without making a huge mess. We contained the confetti in a few ways. 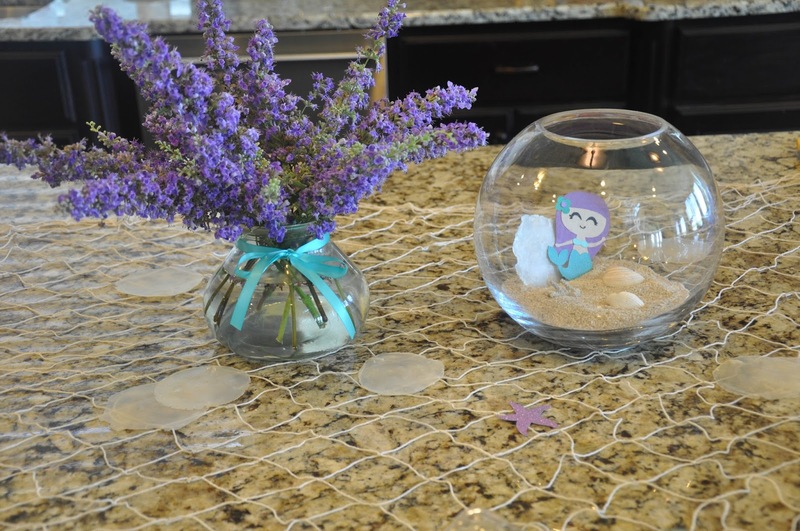 Clear balloons make a great place to add a little confetti and these are an easy DIY touch. 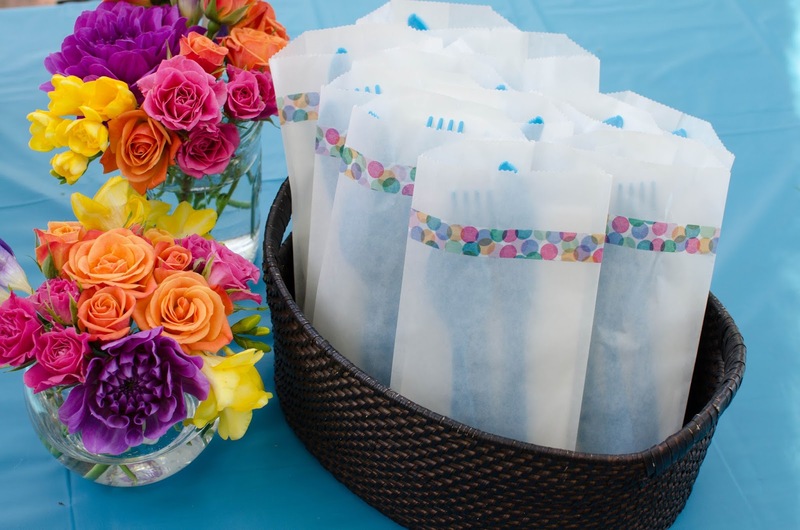 Take tissue paper and fold it several times and insert it into a 1" circle punch to make custom confetti. Then take your confetti to a party store when you place your balloon order. 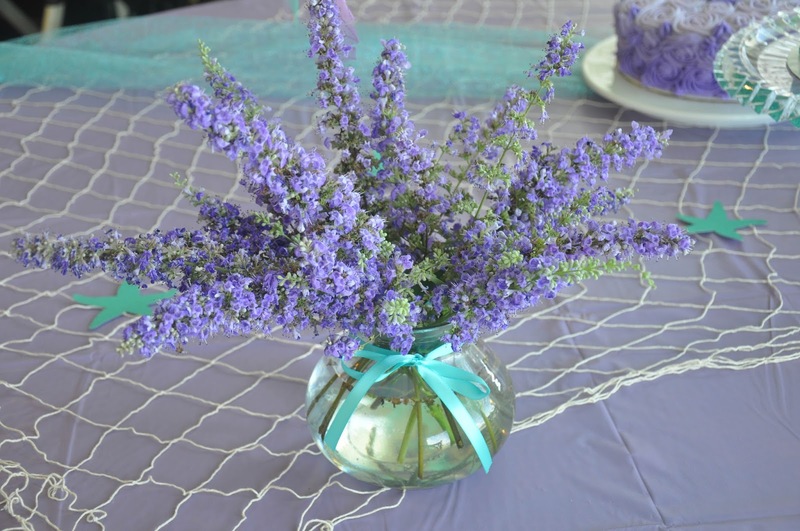 Use clear balloons and stuff them with a handful of the confetti. This is easier with two people, one to hold and one to stuff. 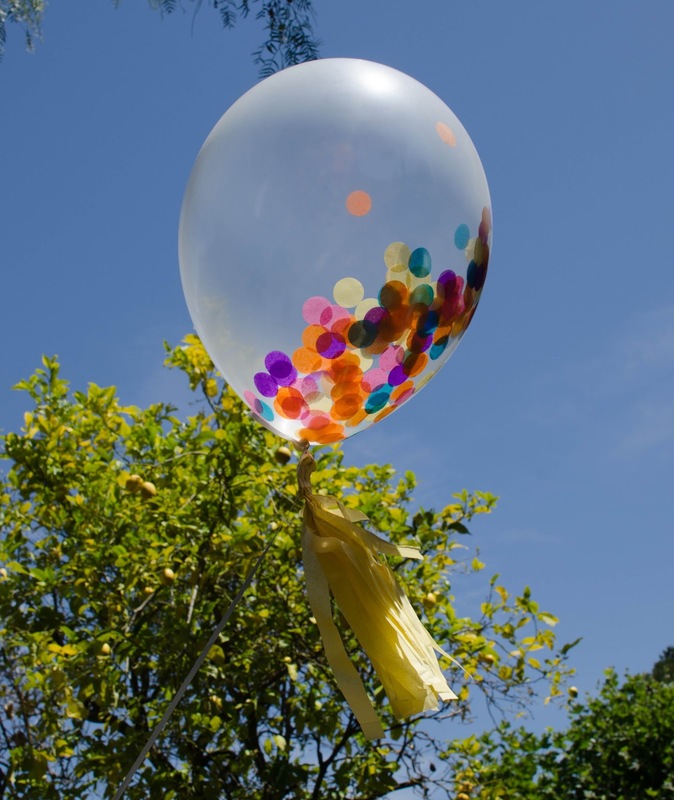 Try not to crinkle the confetti so it lays nice and flat inside the balloon. The stores will inflate your confetti filled balloons and have them ready the day of the party. 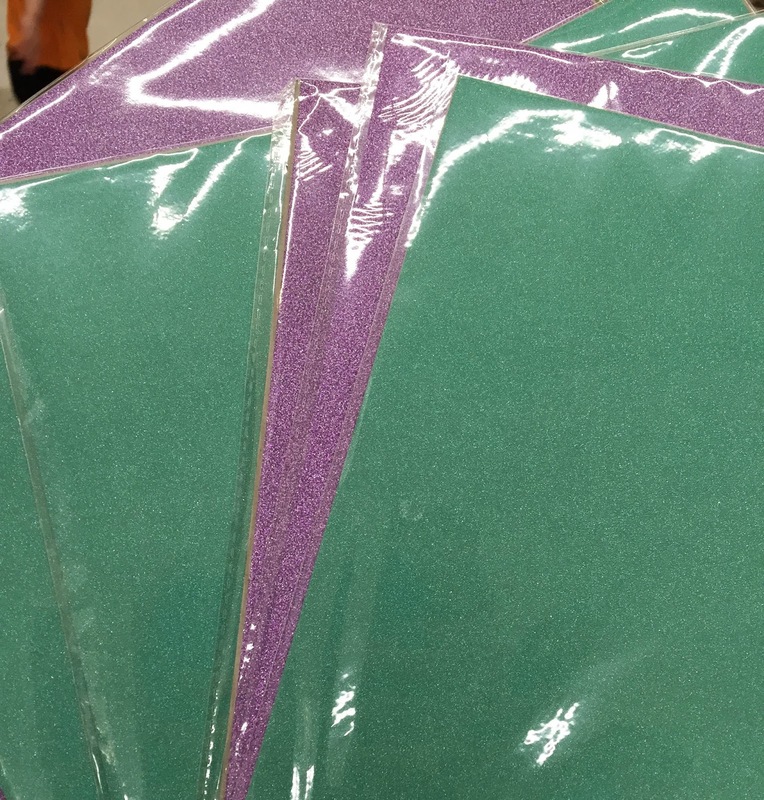 Diddams did not charge any extra for the confetti and only stipulated that it had to be made out of paper. 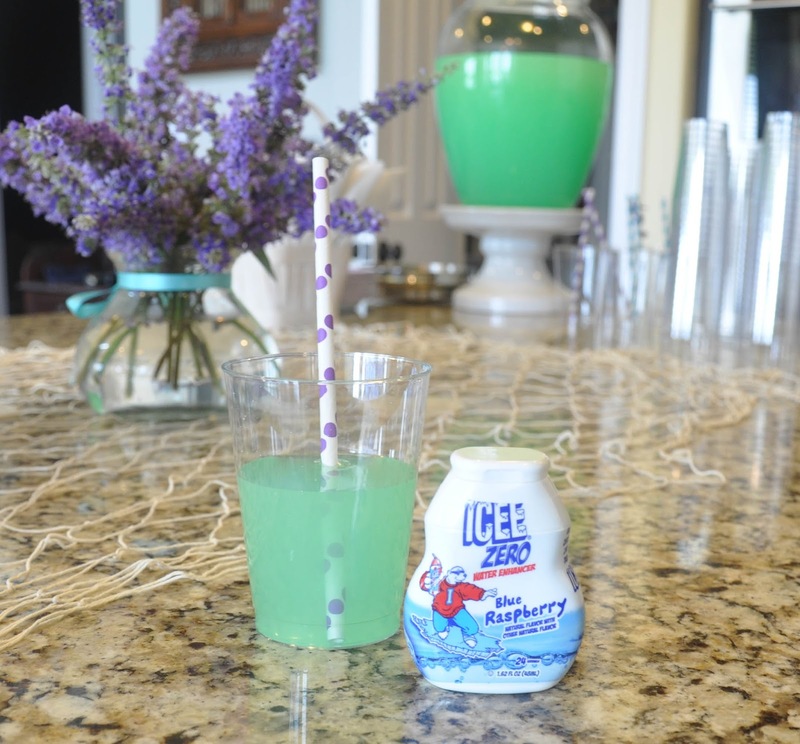 For a little fun with this after the party (or during! ), if you pop the balloon the confetti sprays out and showers you. That will make a mess, but it would probably also make a great picture. 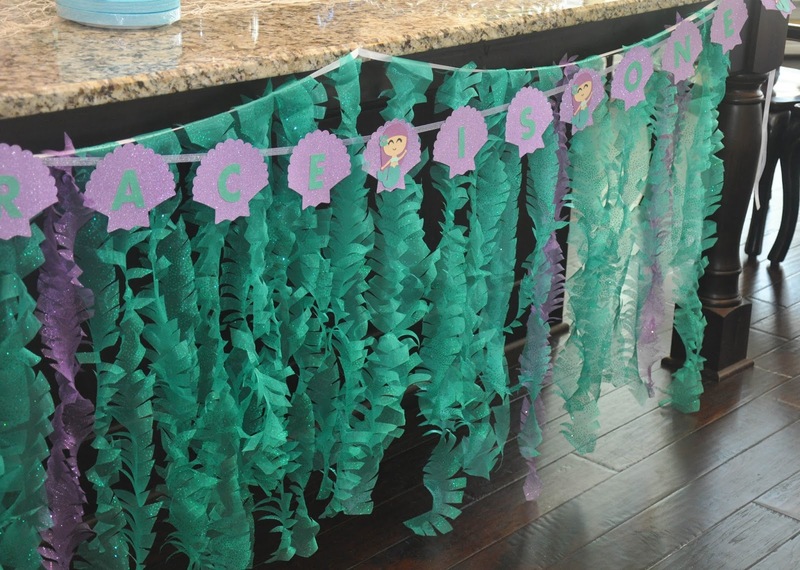 The second way I got a confetti effect in the decorations without the mess, was by creating confetti garlands. 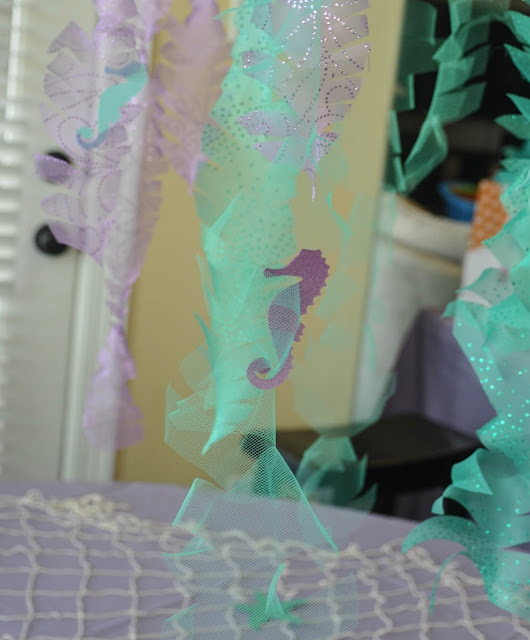 I used my Silhouette Cameo to cut different sized circles in all the colors of the party. Then I took a stack of circles and sewed straight through the center of each circle one at a time to create a garland. This was the first time I had ever sewn a garland and it was by far one of the easiest and quickest ways I have ever put one together. Try it! Just realize it might dull your needle a bit. 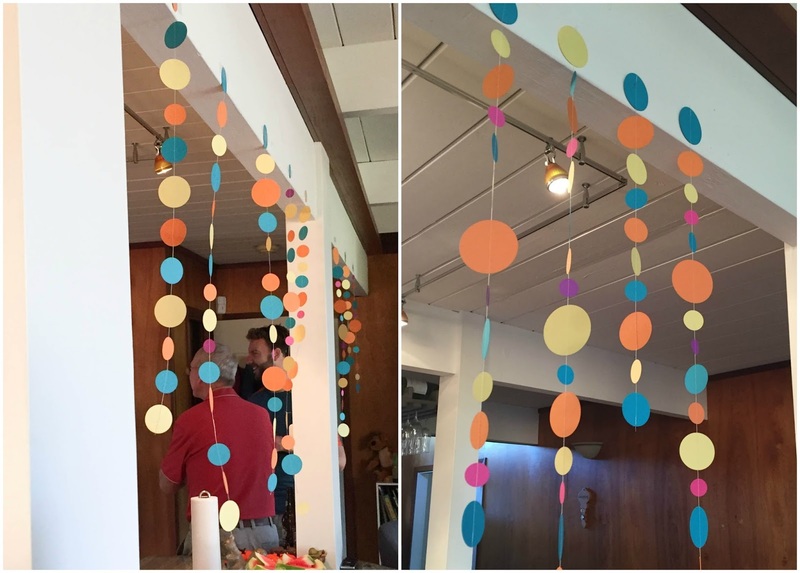 I made enough confetti garlands to hang down throughout the house and give the impression of falling confetti. 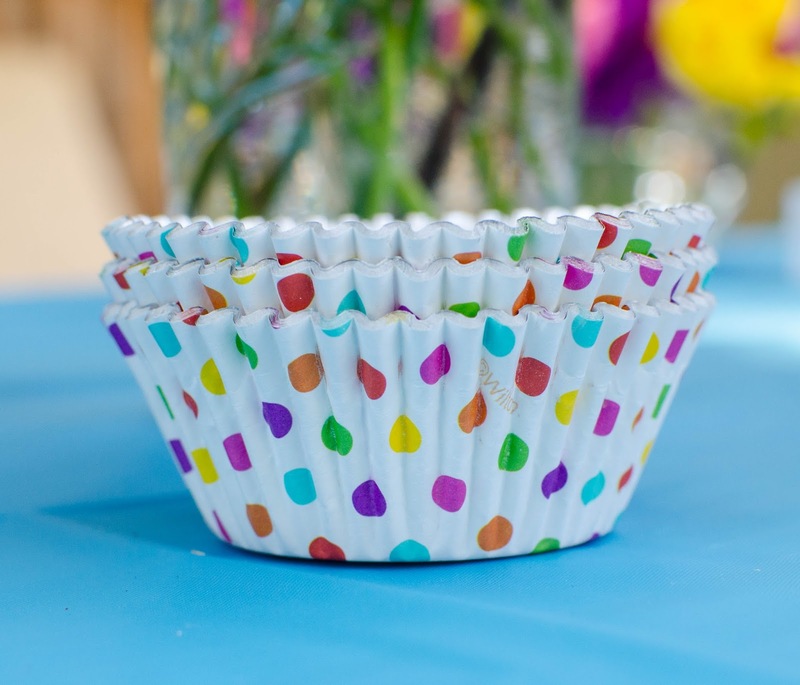 With the theme based around funfetti cupcakes, these cupcake wrappers made the perfect complement to the featured dessert. 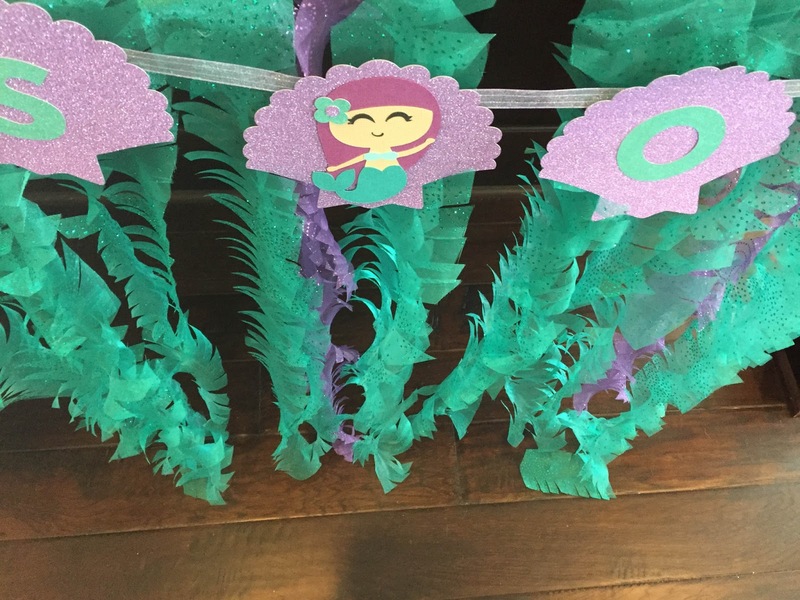 I was able to squeeze in one last confetti decoration and use Washi Tape (yay!) in packaging the utensils. 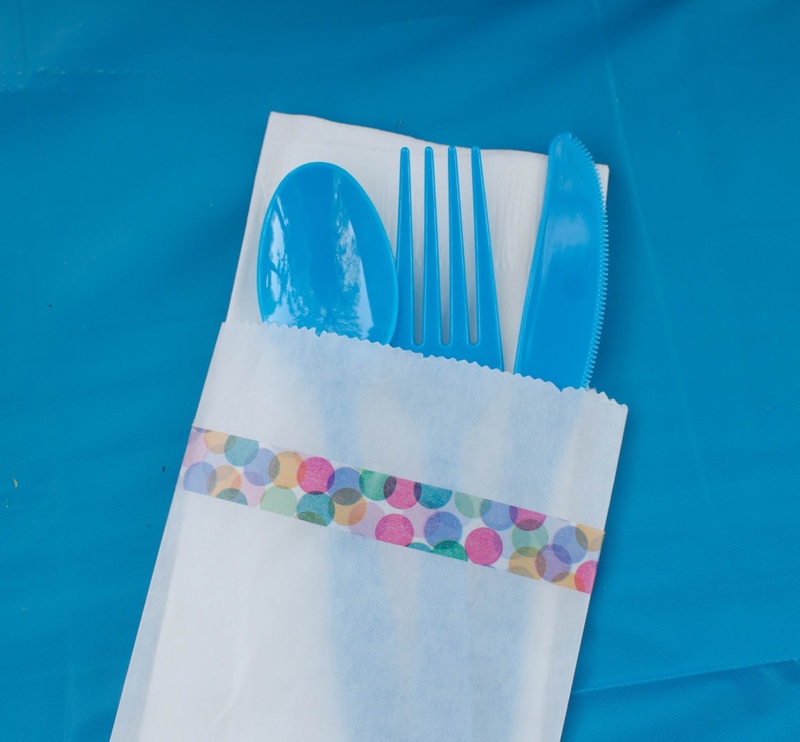 For a backyard BBQ, It seemed like a convenient (not to mention cute) idea to package the utensils and napkins inside a glassine bag so the guests could hold it all easily with one hand while filling their plates. And the confetti washi tape was too good to pass up. 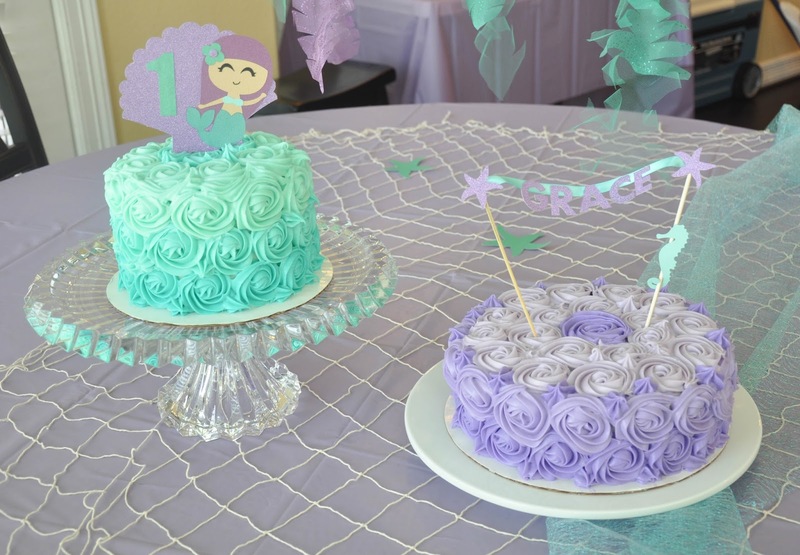 By all accounts the party was a success and the guests loved the festive theme. They sent a few photos for me of the final party prep. 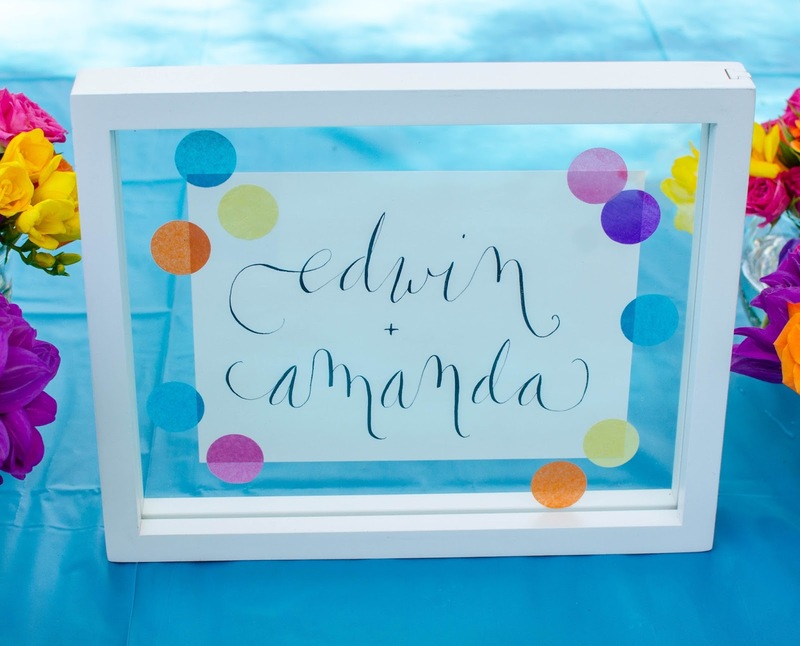 Here's to wishing Edwin and Amanda a lifetime of wedded bliss. 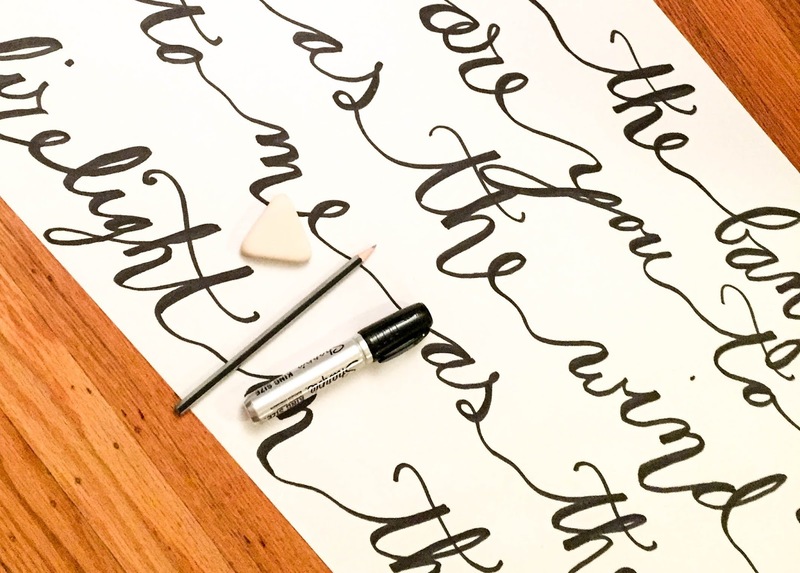 And to you for your patience with how many times I said 'confetti' and 'calligraphy' in this blog post. Here we go...I am attempting a quick blog post. I'm trying to get better about spontaneous blogging, no overthinking, no worrying, just a few thoughts and something fun to share. I have to say after years of primarily technical writing as an engineer, I have found it surprisingly difficult to write with my personality instead of extracting it out. 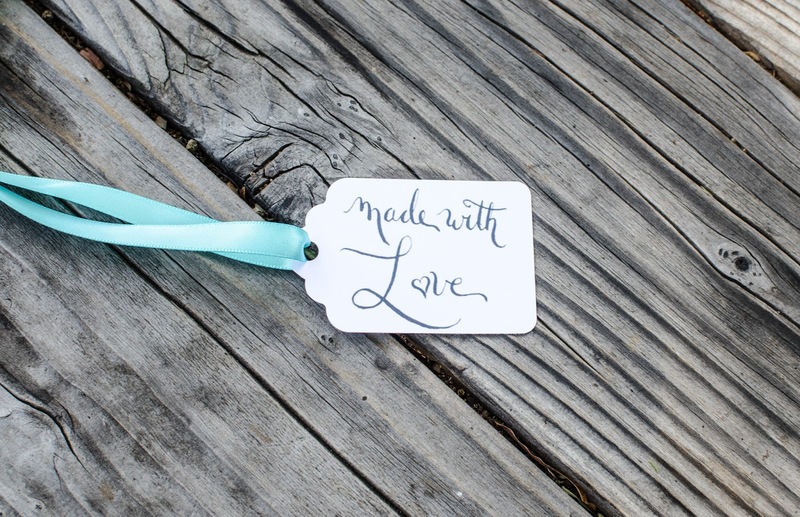 Today's 'quickie' is for all you fellow Makers out there, a little love for your handmade gifts. 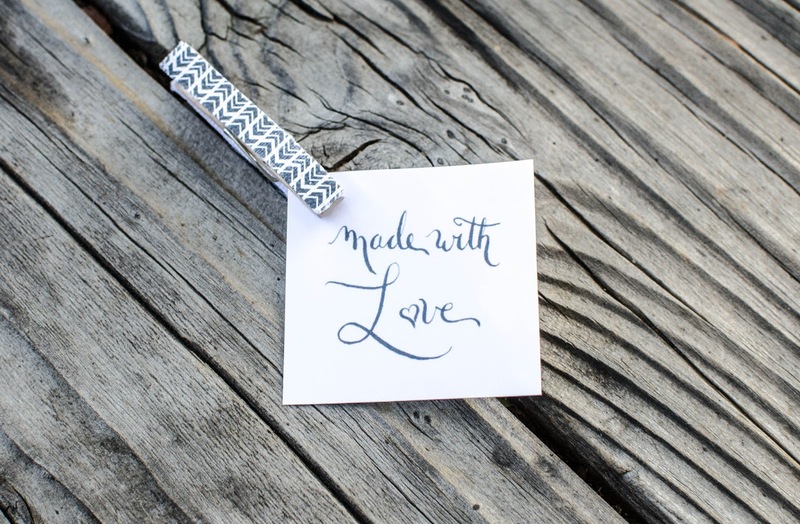 You spend hours lovingly hand making gifts for friends and family, and I think that deserves a little something special for the gift wrap. The inspiration for this tag actually came from a friend. She is knitting a number of gifts for friends and family and asked if I could create a calligraphy design that she could print on care instruction cards. After a few tries, I had a design I was happy with and I am sharing it here free for anyone to use! So here you go. 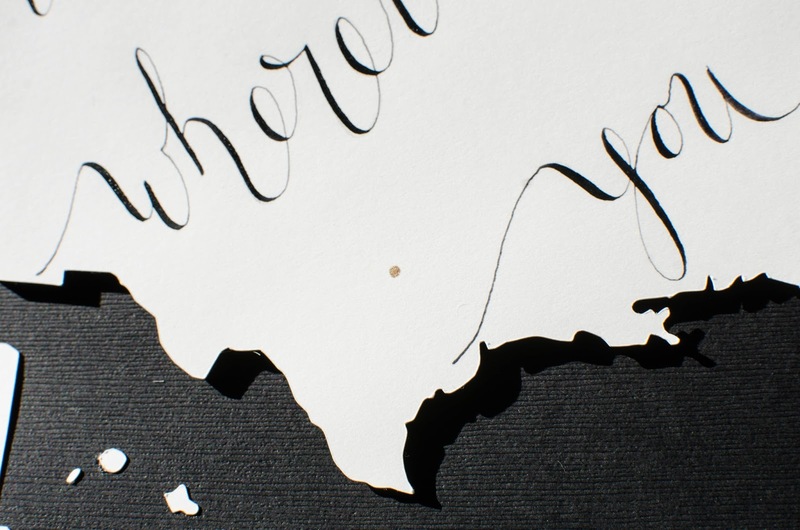 You can print it, resize it, cut it into any desired shape. Have fun with it! Just please do not use this tag for profit or sell it. I'd love to see how you style it and your handmade gifts as well. 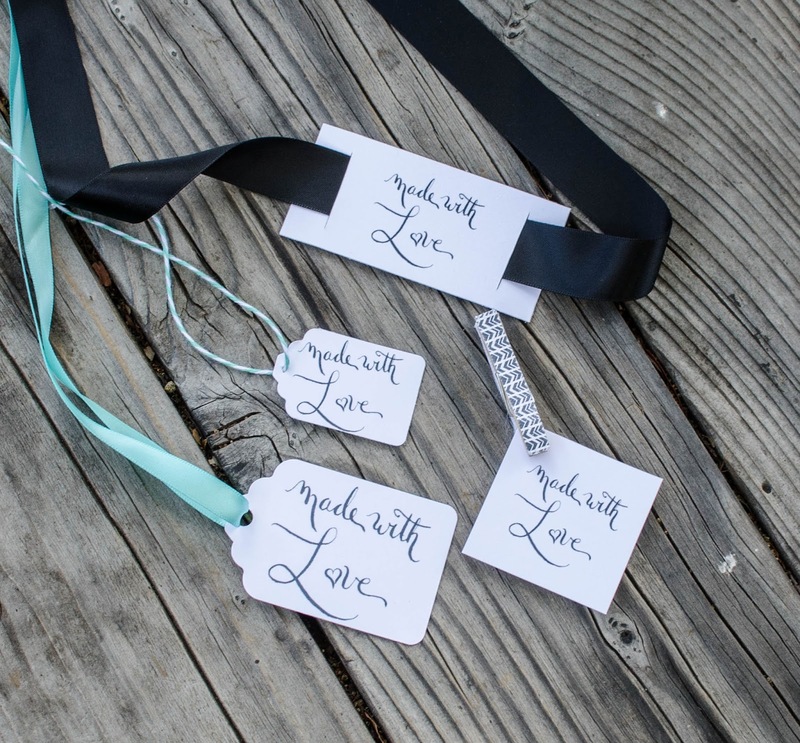 Tag me on instagram @theselittleloves or find me on Facebook. 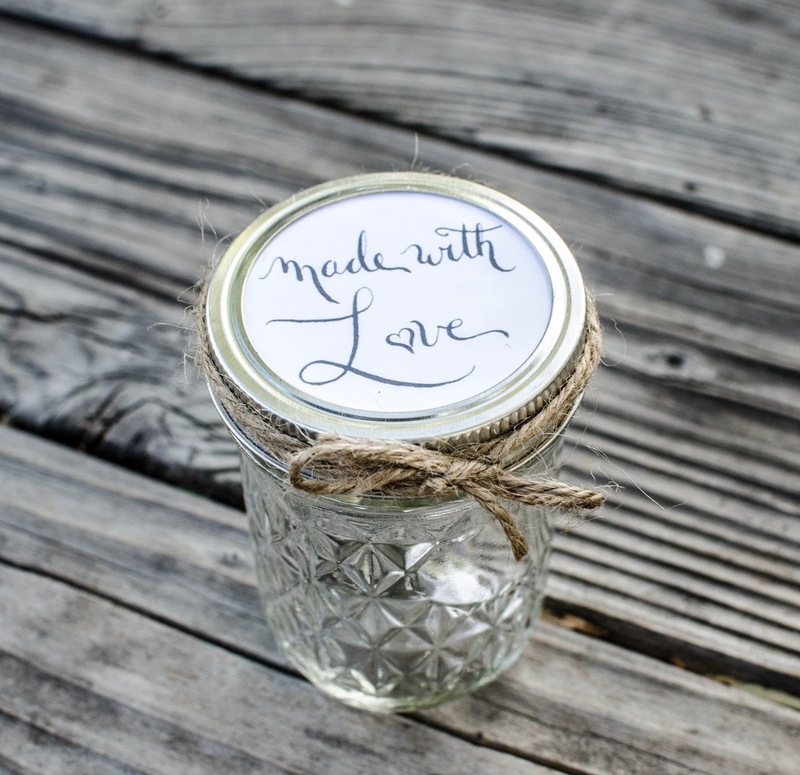 Need inspiration for handmade gifts? Here are a few of my most popular handmade gift ideas: a bunny ear teether, waterproof picnic blanket, grilling prep plates, burp cloths, family celebration plaque, monogram art.